Do dairy animals have to be slaughtered? and I’m still in touch with the owners!
. . . [I]t looks like raising goats for milk involves killing the male babies, or selling them to someone else to kill. Some people actually kill the does too, when they no longer give enough milk. I am looking for some way to avoid this, so that if, for example, one considered that the goats were not “things” but actual beings with consciousness that prefer not to be killed, there might be a way we could do that. In my opinion, this would be very beneficial for humans too on various levels they are not yet aware of. However, I don’t want to create a population explosion of the babies. Maybe this could be offset by the sheer fertilizer value of manure from a herd. Any thoughts from you, if and when you might have time would be appreciated. Depending upon a lot of factors — where you live, your financial resources, how much milk you want to produce — it is possible to produce your own dairy without killing any of the males. In fact, the longer I live this lifestyle, the more I’ve come to realize that there are a lot of problems created by large-scale agriculture that go far beyond the problems usually discussed, such as pollution and antibiotic and pesticide use. Just as chemical use becomes more prevalent as scale increases, so does the need to dispose of the animals that are not producing the food product, whether it is eggs or milk. In Homegrown and Handmade, I talked about how it was possible to have chickens for eggs and not kill old hens, and it is definitely possible to have dairy animals and not kill any of the animals. When you keep animals to produce food for yourself, you do see them as living beings, and you get attached to them. The idea of caring for my old doe during retirement is definitely more appealing to me than the idea of paying more money for commercial milk. And an old doe on my farm is at least enriching my life in some way with her presence. I’m not sure if the same could be said if there were retirement farms with thousands of old dairy cows. 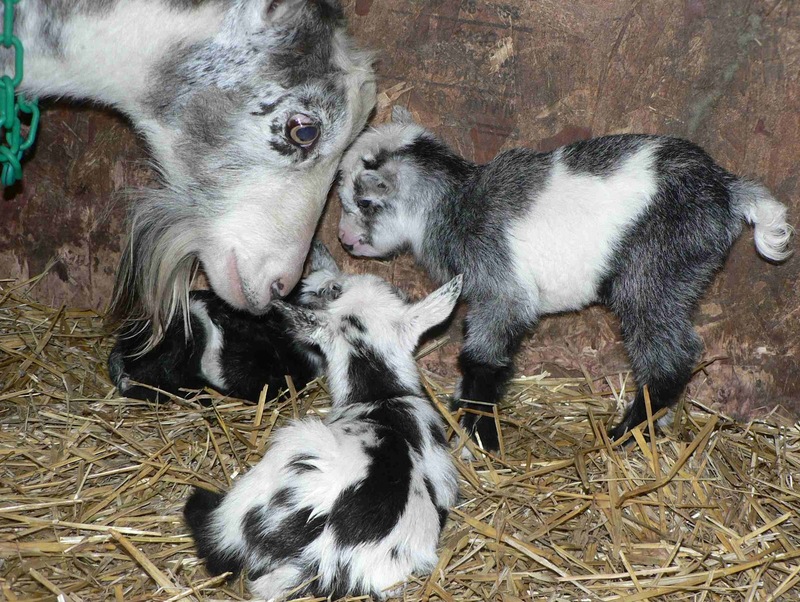 If you are only producing dairy products for your own family, the ideal would be to start with two dairy goats. If they give birth to does, they can grow up to be milkers for you. When they give birth to bucks, they can be castrated and taught to pull a cart, a garden plow, or do other draft work. If you leave a buck intact, you will have trouble with population control because it can be hard to keep a buck fenced in when he knows a doe is in heat. 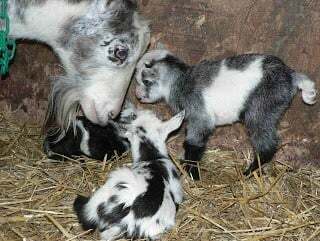 Accidental breedings happen on every goat farm at one time or another. The key to this is to NOT follow the commercial practice of yearly breedings. Commercial dairies breed their cows, goats, and sheep every year to freshen annually. If your goal is milk production for your family, you don’t have to do this. Goats and cows will continue to milk for more than ten months, although that is the standard in the dairy world. For example, a doe or a cow freshens in January. A cow will be bred again in three months so she will calve again in January; a doe will be bred in seven months to kid again in January. They are milked for 10 months and dried up when they have two months left in their pregnancy so they can give enough nutritional support to growing their baby (or babies). If you do not breed them routinely, however, they can continue to milk — provided they have the genetics for it. Why do commercial dairies rebreed every year if they don’t have to? Because when an animal freshens, it reaches the peak of lactation at around six weeks, then production gradually starts to decline. Commercial dairies want that peak. In fact, they’re even willing to inject cows with hormones to get more milk than nature ever intended cows to produce. It is all about maximum production and profit. But that comes at a cost to the animals, the environment, and the people who consume the milk. Mastitis is common in cows that are pushed to over-produce, and their useful life span is only a few years, compared to cows a century ago who could produce milk for a family for a dozen years or more. When I am producing milk for my family and myself, I want to keep my animals as healthy as possible, which means putting them under as little stress as possible, so they will live long, happy, and productive lives. them had weight problems as time passed. I have one doe that I milked for 16 months without rebreeding. She kidded in July 2009, and I milked her straight through to November 2010 when she dried up because she was approaching three months pregnant. You can’t usually do this with a first freshener. In fact, some first fresheners will only milk for six months before drying up. However, each year, their production goes up until they peak somewhere between three and five years of age, and then it plateaus a bit before starting to go down again. Goats can be productive until they are about nine or ten years old. I’ve personally never pushed them beyond that, so some might say they can go longer, but I kind of feel like they deserve to retire by then. Star at age 10, enjoying retirement. I don’t really see myself butchering retired does. I’m very close to them because I’m with them when they give birth, and then I milk them regularly. I know them better than I know many of the humans in my life. I can see, however, that in a commercial dairy where you have thousands or even hundreds of milkers, you are only looking at your milk output records, and the animals are numbers. My first milk goat, Star, is still here and just celebrated her 13th birthday last month, even though she last freshened when she was 9 years old. She just hangs out in the pasture, usually with the kids, which she seems to enjoy. She’s a healthy old girl, and the only real cost associated with her retirement is the small amount of hay that she eats during the winter. So, you can certainly keep your beloved does for as long as you can afford to feed them. So, what to do with the males that are born? 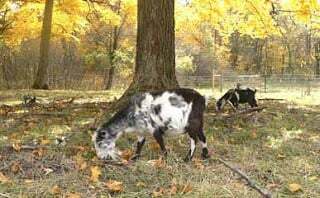 One of the things I like about raising Nigerian dwarf goats is that most of the males are sold as pets to people who have a couple of acres and want pasture ornaments or playmates for their grandchildren. With standard dairy goats, the “extra” males are usually sold for meat, but I’ve never sold a goat for meat. If you are concerned about finding a good home for them, however, you can keep them and use them for a variety of things, including those mentioned above. I know one person who has trained four goats to pull a cart. Goats can be used as pack animals also, and they can be rented out as brush clearers. I used to post articles regularly on my Antiquity Oaks blog about one place or another where goats were used to clear out the underbrush where heavy equipment could not access or was considered dangerous for one reason or another — such as in one area where they were afraid they would kill endangered turtles if they brought in heavy equipment. I’ve never tried to figure out how much our goats are worth in terms of garden fertility, but composted goat manure and straw is our one and only source of fertilizer in our garden. If you had more compost than you could use, you could also sell it. So, the bottom line is that there are a number of ways you can produce your own dairy products and avoid killing any of the animals involved, provided you have the financial ability to pay for their feed, as well as the pasture space so they can live in healthy, uncrowded conditions. 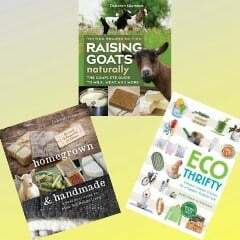 And those animals can have productive lives contributing to your homestead in ways other than meat production. It’s interesting that I received this email when I did because I had been working on a post about eating meat from the animals that you raise. A lot of people don’t understand how we can eat meat from our animals, but I’ll explain how that came to pass in my next post. I had not thought of trying to keep a lactation going for more than a year. Wish I'd thought of that before I let Eddie dry up. Does this work better with the African breeds that are less seasonal in their breeding? I suppose the vegetarian inquirer might seek out breeds / bloodlines that are more likely to have single births, and avoid those that tend to produce triplets. Actually, the Swiss breeds do great with extended lactations. I know someone with a saanen who milked for two years without rebreeding, and there was an article about this in Dairy Goat Journal a year ago. Breed doesn't matter. Lactation has very little to do with the breeding cycle. Seasonal breeders ovulate when the number of hours of light are decreasing. Ovulation is actually triggered by something in their eye. I wish I remembered all of the scientific labels and terms, but this info came from a vet professor doing a lecture on artificial insemination a few years back. Lactation, on the other hand, just keeps happening (to some degree) as long as there is a demand and the goat isn't pregnant. The only effect that season seems to have on lactation is that someone did do a study on breeding NDs in spring vs fall, and spring fresheners produced slightly more milk — but that was in a 305-day standard lactation. They were studying the possibility of using NDs for a year-round dairy and having half of the does freshen in fall and half in spring. 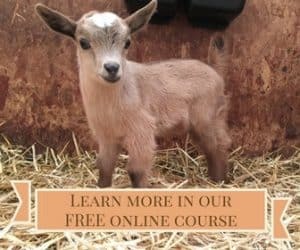 I had initially thought about suggesting Swiss breeds because they tend to twin, but then it clicked that the number of mouths to feed isn't as important as how much they're eating, and standard goats eat 2-3 times as much as Nigerians, so two big goats would eat as much as four to six NDs. Because triplets and quads tend to run in families, however, he could go with NDs that have a family history of having fewers kids. I always learn something new from your posts. I didn't know that weight gain was related to extended lactation. I haven't tried it because I really need those 2 months off myself! The question i have is do humans really need milk after a certain age, as animals nurse to a certain age and then dont drink milk again. We nurse off our mothers milk do we really need milk from a different species….. i think not. Animals dont. This is a bit late for a reply to this post (4 years!) but I just want to comment because I have a LaMancha doe that I recently dried off as she is due to kid in about six weeks. She was milking 3 quarts per day with just one milking in the morning. If I had been milking her twice a day I'm sure she would have been giving at least a gallon per day. Her first and only kidding was in July 2013 which means that if I had not bred her this year she would have been milking for three years as of July this year (2016). For the coldest couple of months (January, February) she would go down to about a quart per day and then gradually come back up to full production by about April. The only reason I bred her this year is because we have to be gone for a week this summer and I don't have anyone that can milk her if I'm not here. The point being…..it is possible for a doe to milk for years without producing kids that you don't know what to do with.